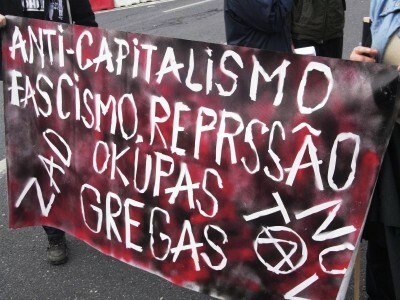 Last Saturday, January 26th, between 2.30pm and 6pm, there was an anti-authoritarian protest against capitalism, fascism and repression, in solidarity with the comrades from Greece and the entire world, and in support of liberated spaces held in Lisbon. The communiqué specifically dealt with the frontal attack of the Greek State against the anti-authoritarian movement; the political repression of activists in the ZAD (Zone à Défendre, against the new airport in the outskirts of Nantes, France) and fighters against the TAV (Italy); the repression of the indigenous movements; the violent repression of the mass demonstrations around Europe (as on the 14N general strike); and the attack of the police with tear gas against young students of the basic education in a school in Braga (Portugal). A call to a struggle without borders. About 1,000 communiqués were distributed to the population and in the teachers’ protest that took place on the same afternoon, where around 30,000 demonstrators participated. The anti-authoritarian march, with banners and black flags, ended at Largo Camões around 5pm, where the activists stayed for over an hour with comrades from other parts of the country showing their solidarity, and more information and pamphlets were spread to passers-by. The rebels and the free: we will give them a crisis! Solidarity is our best weapon! War on the war of the powerful!